Hail is precipitation that falls as hailstones, which are balls or irregular lumps of ice typically measuring between five and 50 millimeters (0.2 - 2 inches) in diameter, and with even larger stones coming from severe thunderstorms. Hail is always produced by cumulonimbi (thunderclouds), usually at the front of the storm system. Hailstones comprise multiple layers of transparent ice or layers alternating between transparent and translucent ice, with each layer usually being at least one mm (0.04 in) thick. Small hailstones may be less than five mm (0.2 in) in diameter, but even they are layered and can be irregular and clumped together. Ice pellets, which are another form of precipitation, are also ice chunks falling from the sky, but ice pellets, unlike hailstones, have no layers. Severe hailstorms have led to enormous loss of life and damage to property. A large hailstone, about six centimeters in diameter. Hailstones are usually range in size from that of a pea to that of a golf ball. They form inside thunderclouds as the result of updraft and down draft winds operating on supercooled water droplets. The hailstones begin as condensation nuclei, such as dust particles, tiny insects, microorganisms, or ice crystals in the midst of supercooled water droplets, which freeze on contact with the condensation nuclei. Inside the clouds containing both ice nuclei and a large number of supercooled water droplets, the ice crystals readily attract droplets to join the growing hailstones because there is a slightly lower energy threshold for the droplets to freeze on the ice crystals than for the droplets to join together into larger droplets. If the hailstones grow large enough, latent heat released by further freezing may melt their outer shell. The growth that follows, usually called wet growth, is more efficient because the liquid outer shell allows the stone to accrete other smaller hailstones in addition to supercooled droplets. All this process is ongoing under the influence of the updrafts and down drafts, which leads to the hail growing increasingly larger until it becomes too heavy to be supported by the storm's updraft and falls out of the cloud. Cutting a hailstone in half reveals a series of concentric rings, like those of an onion. These rings record the total number of times the hailstone had traveled to the top of the storm before falling to the ground. The largest hailstone ever measured, 17.8 cm (7.0 in) in diameter with a 47.6 cm (18.75 in) circumference. Hail forms in strong thunderstorm clouds, particularly those with intense updrafts, high liquid water content, great vertical extent, large water droplets, and with a good portion of the cloud layer being below the freezing temperature of water (0 °C (32 °F)). The growth rate is maximized at about -13 °C (9 °F), and becomes vanishingly small much below -30 °C (-22 °F) as supercooled water droplets become rare. For this reason, hail is most common in mid-latitudes during early summer where surface temperatures are warm enough to promote the instability associated with strong thunderstorms, but the upper atmosphere is still cool enough to support ice. Accordingly, hail is actually less common in the tropics despite a much higher frequency of thunderstorms than in the mid-latitudes, because the atmosphere over the tropics tends to be warmer over a much greater depth. Also, entrainment of dry air into strong thunderstorms over continents can increase the frequency of hail by promoting evaporational cooling, which lowers the freezing level of thunderstorm clouds giving hail a larger volume to grow in. Hail is also much more common along mountain ranges because mountains force horizontal winds upward in a process known as orographic lifting, thereby intensifying the thunderstorm updrafts and making hail more likely. One of the most notorious regions for large hail is northern India and Bangladesh, which have reported more hail-related deaths than anywhere else in the world and also some of the largest hailstones ever measured. Mainland China is also notorious for killer hailstorms. Certain locations in North America (such as the area around Calgary, Alberta) have gained the nickname "Hailstorm Alley" among meteorologists for the frequency of hailstorms and their severity. 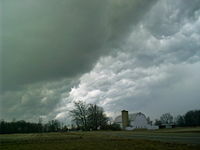 Hail clouds often exhibit a characteristic green coloration. Hailstones, while most commonly only several millimeters (a few tenths of an inch) in diameter, can sometimes grow to 15 centimeters (5.9 inches) and weigh more than half a kilogram (1.1 pounds). Pea or golfball-sized hailstones are not uncommon in severe storms. Hail can do serious damage, notably to automobiles, skylights, glass-roofed structures, and most commonly, farmers' crops. Rarely, massive hailstones have been known to cause concussions or fatal head trauma. Sometimes, hail-producing clouds are identifiable by their green coloration. 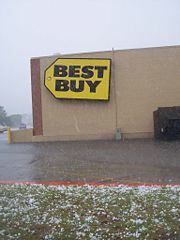 April 20, 2006 hailstorm on San Marcos, Texas. Around the ninth century, several hundred pilgrims were killed by a massive hailstorm in Roopkund, Uttarakhand, India. March 29, 1990: Last known hail fatality in the United States. Juan Oseguera, a nineteen year old man who died from head injuries after being hit by a softball sized hailstone in Lake Worth, Texas. July 11, 1990: Denver, Colorado, USA, Softball-sized hail destroyed roofs and cars, causing $625 million in total damage. September 7, 1991: a Labor Day thunderstorm caused $400 million worth of insurable damage in Calgary. Thirteen additional hailstorms between 1981 and 1998 caused an estimated $600 million in damage in the Calgary area alone. May 5, 1995: Dallas and Fort Worth, Texas, USA, $1.1 billion insured losses. April 14, 1999: Sydney, New South Wales, Australia, $1.5 billion. 20,000 properties and 40,000 vehicles were damaged during the storm with more than 25 aircraft damaged at Sydney Airport, one person was killed while fishing after getting struck by lightning and several other people were injured. It was the costliest hailstorm to hit an Australian populated city. Largest stone measured was 9.5cm. May 18, 2000: McHenry, Lake, northern Kane, and northern Cook County, Illinois, USA, $572 million. Golfball, baseball, and softball-sized hail damaged roofs, cars, patio furniture, skylights, and windows in the area's worst and most widespread hailstorm in 30 years. Around 100,000 homes lost power. Hail was three inches deep in many areas. There were 100 canceled flights, and train service was disrupted. April 10, 2001: St. Louis, Missouri, USA, Costliest in US history, largest swath of very large hail, more than $1.9 billion insured losses. July 19, 2002: Henan Province, the People's Republic of China, 25 dead and hundreds injured. June 22, 2003: Aurora, Nebraska, USA, Largest hailstone on record falls. It has a seven-inch diameter and a circumference of 18.75 inches. Small hail that has been fractured to show internal structure; 246x magnification. The inset shows the original hail. A field littered with large hailstones right after a summer hailstorm. Small transparent hail beads on the ground after a short spring storm. Large hailstones up to five cm in diameter with concentric rings. The coin diameter is 21.25 mm. ↑ Chinook Zone Weather Retrieved October 16, 2007. ↑ Video accompanying entry for "hail" in Britannica Online, Academic Edition. ↑ Hail storms rock southern Qld ABC News Online. Retrieved October 16, 2007. ↑ Severe Thunderstorm Images of the Month Archives - 1997 Australian Severe Weather. Retrieved October 16, 2007. ↑ Orr, David. 2004. Giant hail killed more than 200 in Himalayas Telegraph. Retrieved October 16, 2007. ↑ Softball-size hailstone kills man CNN Weather. Retrieved October 16, 2007. ↑ Urban hailstorms: a view from Alberta Springer Link. Retrieved October 16, 2007. ↑ The Sydney Hailstorm - 14 April 1999 Australian Government Bureau of Meteorology. Retrieved August 24, 2007. ↑ Welch, Daniel M. 2006. Researchers clear the skies for safe weather Medill News Service. Retrieved October 16, 2007. ↑ Southwell, David. 2000. Storms blast suburbs Chigago Sun-Times. Retrieved October 16, 2007. ↑ Storm Data and Unusual Weather Phenomena National Weather Service. Retrieved October 16, 2007. This page was last modified on 25 July 2017, at 21:02.